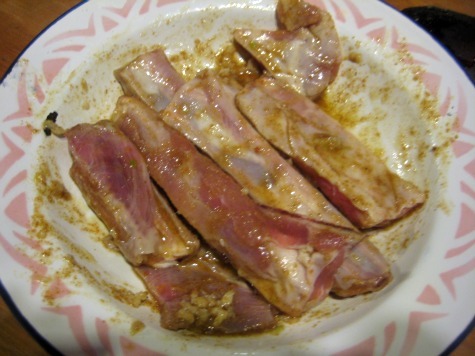 How to cook lamb ribs? Well, I admit, we learned the slow way. For years when we butchered our lambs at the farm, we used to throw away the ribs. No one in our family wanted to eat them--but no more. No Way! We learned how to cook lamb ribs. "There's no such thing as an inferior cut of meat." That's an old saying, but I never believed it until my wife cooked such a tasty dish of lamb short ribs. She made a believer out of me. Now I'm emphatic--There is no such thing as an inferior cut of meat! It all depends on your recipe and how you cook it. 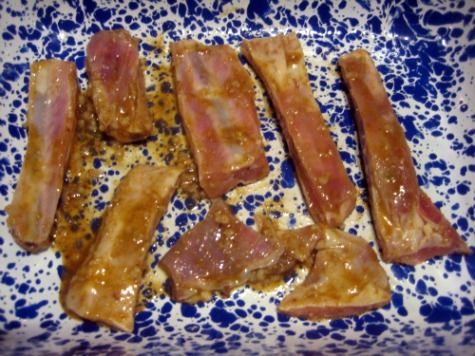 What lamb rib recipe did my wife use to prepare such a tasty dish? She adapted a Moroccan lamb riblets recipe from "Forgotten Skills of Cooking" by Darina Allen. Darina Allen has been called "the Julia Child of Ireland" by the San Francisco Chronicle. You can find the original recipe on page 242 of her book. I print my wife's adaptation here. 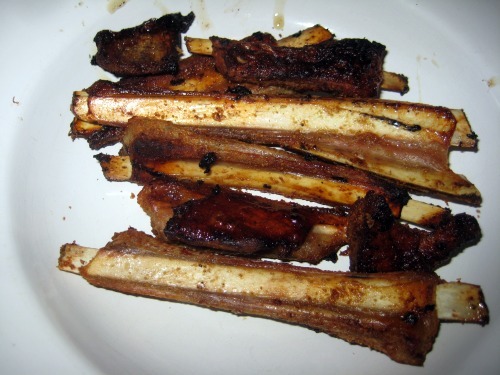 Section the short ribs (sometimes called spare ribs or riblets) into individual sections. This is easily done by cutting alongside each rib. Heat a mid-sized pan to medium heat. Use a little butter to keep powder from sticking. Add coriander and cumin power and stir about a minute. Transfer to a bowl and add garlic, olive oil and lemon juice. Stir. Add the lamb riblets and marinate for at least half an hour. Pre-heat the oven to 400° F. Lightly salt the lamb, spread in roasting pan and cook for about 20-25 minutes. The riblets are small and have a delicate flavor. My wife served them with potatoes and a broccoli dish. Darina Allen describes the riblets as "irresistible." The comments around our table were "delectable", "tasty", "I liked 'em" and "May I have some more?" All this, and like I said, we used to throw away the ribs! What made the difference? We just learned how to cook lamb ribs. Thanks, Darina.